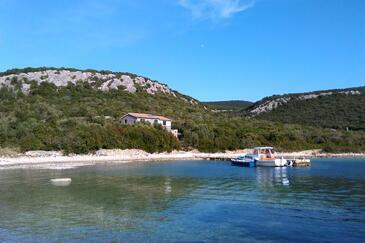 House 11391 in the town of Kobiljak, Pašman - North Dalmatia is located 15 m from the sea. The nearest beach to this accommodation is a rocky beach beach. The house is categorized as "Facilities near a beach". You will be the house's only guests during your holiday, as there are no other rooms or apartments. The hosts will not be in the house for the duration of your holiday. The yard area has a surface of 600 m2. A holiday in this house can include a boat if you book it in advance. A boat mooring is available, but it must be booked in advance. Facilities more than a kilometer away are: Shop, Pharmacy, Urgent medical care, ATM/Bank machine, Night club, Centre, Restaurant. The property cannot be reached by car. The parking lot is more than 100 meters away from the facility. Reserved facility is "Robinson Crusoe style" type of facility. More than 100 meters of the road leading to the facility is of macadam type. House can accommodate 6 guests. Beds are situated in 2 sleeping rooms, but also in the living room, within 49m2. Guests can enjoy a sea view from the private terrace. Food can be prepared using barbecue which is shared with other guests too. Note: The host prefers bookings from saturday to saturday. Polish (original) English (Google Translate) Z nazwą Dom Wędkarski bym polemizował. Zarówno w zatoczce jak i w jej okolicy ryb brak. Z nazwą Dom Wędkarski bym polemizował. Zarówno w zatoczce jak i w jej okolicy ryb brak. Hungarian (original) English (Google Translate) Szuper hely, csodás környék, vadregényes táj, tökéletes környezet a pihenésre. 4x4 és felezőváltó kellett, hogy a házhoz bemenjünk autóval. Szuper hely, csodás környék, vadregényes táj, tökéletes környezet a pihenésre. 4x4 és felezőváltó kellett, hogy a házhoz bemenjünk autóval.